Every July, Microsoft kicks off their fiscal year by gathering of all of their business channel partners from around the world and hosting the Microsoft Worldwide Partner Conference (WPC). This summer, WPC 2012 was hosted in Toronto so we were exceptionally excited to take part and what an event it was! 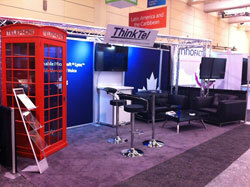 ThinkTel’s presence at WPC 2012 was remarkable. Apart from the many conversations (…and parties) that took place, we were a Bronze sponsor of the event and had a large exhibit fully equipped with a Lync demo and red telephone booth, as well as Lync T-Shirts with original slogans that were a huge hit (images below). Our T-Shirts were even mentioned in the Microsoft Canada key-note presented to hundreds of partners with a special shout-out to ThinkTel!